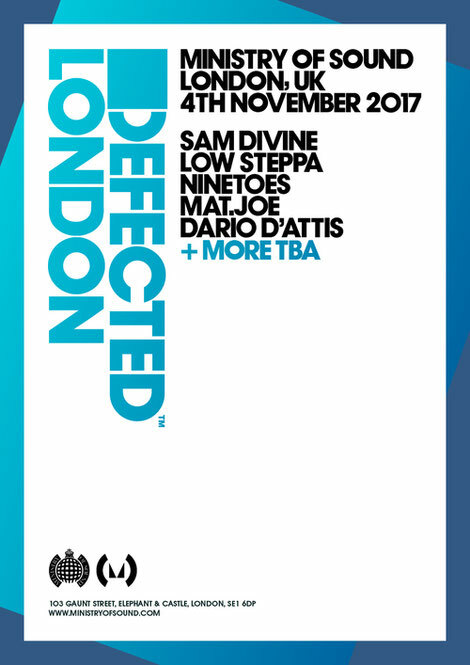 Saturday 4 November will be Defected London’s first event since the end of the Ibiza season, which has seen Defected taking over Sundays at San Antonio’s, Eden, for 20 weeks. Bringing the party home to Ministry of Sound to fill the Box, the Loft and the 103 with house basslines and 4/4 beats are Sam Divine, Low Steppa, Ninetoes, Mat.Joe and Dario D’Attis. Sam Divine is a label head in her own right and has spent her summer between dates at Defected Ibiza, playing festivals around the world and supporting her D-Vine Sounds label family, all alongside recording the Defected Radio Show. Joining her is Low Steppa, the man behind the Simma Black imprint which has recently achieved 100 releases. Hot from sets at Defected Croatia including on board the Simma Black boat party, he has had a summer playing dates around Europe. True to Defected’s ‘family’ ethos, all artists on the bill have released music on Defected or sub-label DFTD. Ninetoes’ ‘Come Back’, released in May this year on DFTD, has been on steady rotation throughout the summer, echoing the success of his 2013 track ‘Finder’. Dario D’Attis has become popular for remixes and punchy original edits, guest-mixing on the inaugural ‘Defected Croatia’ album. His track ‘Sunshine People’ on Defected has apparently become a sought-after track. Mat.Joe complete the line-up, a duo based in Berlin who are making waves with their crisp house sound, with soul and hip hop influences. Their remix with Sonny Fodera of Gershon Jackson’s ‘Take It Easy’ has been one of the longest-charting tracks in Beatport history, hanging in on the house chart for over 18 months.